Purple Plum Fairy: The Ultimate Throwback: Flying House Is Back! The Flying House is back. Yes, you read that right. Our well-loved children animation series about a flying house which transports us back to the olden times including Jesus' time. And it's now back on TV for the new generation of kids to enjoy including millennials. “We want to bless the children of the Philippines with the Word of God through animation that’s why we are re-airing ‘The Flying House.’ It has blessed millions of people from the ‘80s and there is a new generation now that can also be blessed by it,” said John Tan, Executive Vice President and Chief Operations Officer of CBN. “The gospel can be quite difficult for children to understand,” Tan continued, “but through animation which is one of the easiest forms of media that children can watch, today’s generation can really be more attuned to God’s Word. May it be the light that guides them as they grow up,” he added. “The Flying House” is a children’s anime series produced by the Christian Broadcasting Network and airs every Saturday at 9:30 a.m. on ABS-CBN and back to back with Superbook Reimagined every Sunday, 9:30 a.m.
Join us in celebrating the official launch of The Flying House and the first year anniversary of Superbook Reimagined’s airing in ABS-CBN. 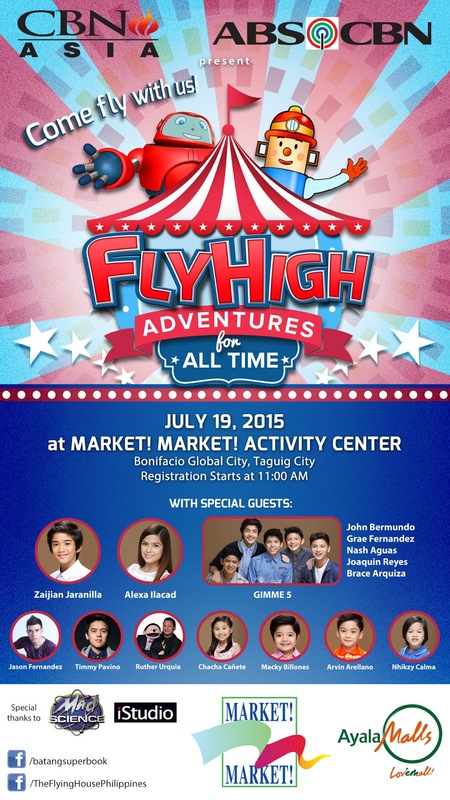 The event entitled, "Fly High Adventures for All Time," will be at Market! Marke!t on Sunday, July 19, 2015. Meet Superbook’s Gizmo as well as your favorite artists like Gimme 5, Alexa Ilacad, Zaijan Jaranilla, Jason Fernandez, Timmy Pavino, and many more. Registration starts at 11:00 a.m. See you there! For updates, LIKE the following pages - www.facebook.com/theflyinghousephilippines and www.facebook.com/BatangSuperbook.